Be as mad as a hatter with this Mad Hatter top hat from “Alice in Wonderland. 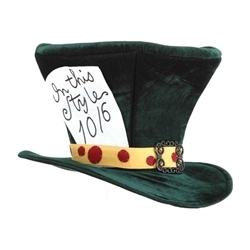 This Mad Hatter top hat is made of green velour and has a yellow and red poke-a-dot band with attached buckle. The crown of the top hat measures 15” high, has a 5” brim, and will fit a head measurement of up to 23.5” using an adjustable Velcro band.